"Well played, Mauer," appears to be finished as a catch phrase for MLB The Show with today's naming of Boston's Adrian Gonzalez as the cover star for next year's edition of the game. He displaces the Minnesota Twins catcher Joe Mauer, who held the packshot for the past two years. Sony dated the game, too, telling the public it will be available March 6. That's per the usual, sports titles normally have fixed dates and baseball's is the first Tuesday of March. 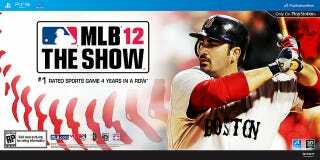 MLB 12 The Show will publish a version for PlayStation Vita, Sony said, and it will take advantage of the new handheld's capabilities.